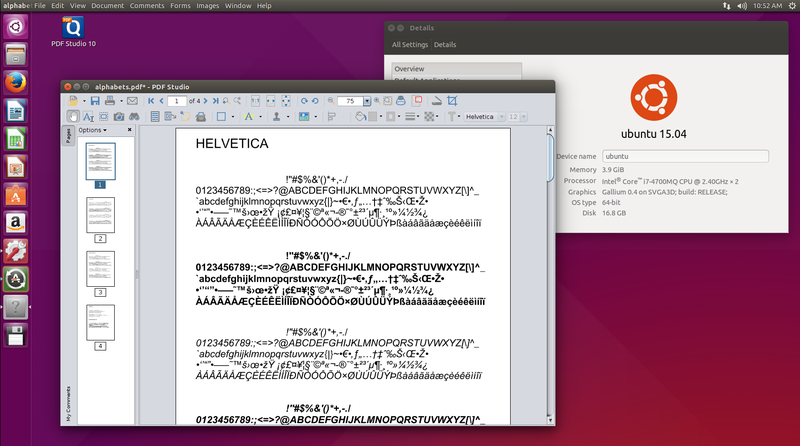 Q: Does PDF Studio work on Ubuntu 15.04? A: Yes, PDF Studio is currently fully compatible with Ubuntu 15.04. Update: There is a known issue with Scanning on Ubuntu 15.04 (read more below). We have tested PDF Studio on Ubuntu 15.04 and we’re able to confirm that our PDF editing software works properly on the new Ubuntu OS. As a user, you should experience no issues with installing and running PDF Studio if you upgrade to Ubuntu 15.04. At this time (4/2015), the sane daemon does not fully support Ubuntu Vivid. Support for Ubuntu in Vivid should be considered alpha grade support at the moment. Some people have had success getting it run, many have found that it does not work. The developers are working on it. If you need to set up a network scanning server, you should do so with Ubuntu 14.04 until this is corrected by the sane project upstream. If you come across any issues at all please feel free to let us know by going to Help->Email Support or sending us an email directly to studiosupport@qoppa.com. What's in PDF Studio 10?